Wintry weather returned to Tokyo and neighboring regions on Wednesday, with the threat of heavy snowfall in some mountainous areas through Thursday morning, the Japan Meteorological Agency said. 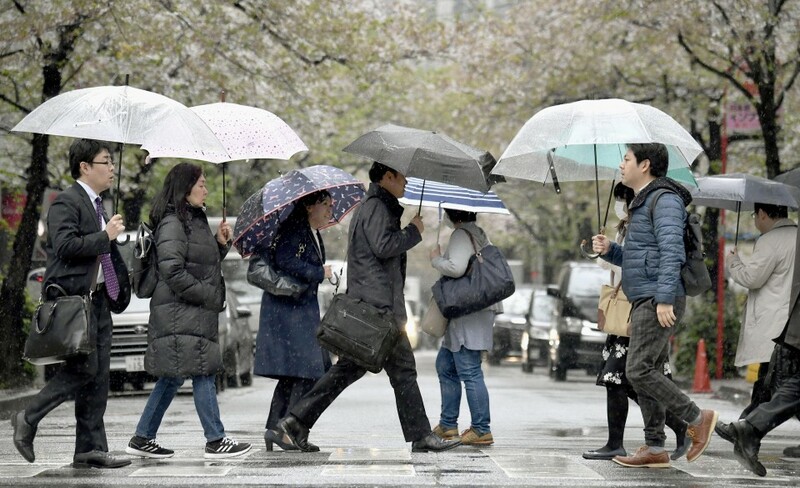 Commuters in central Tokyo were wrapped up in thick coats and scarves amid rain and a northerly wind, as the thermometer touched 5.1 C at noon. It was forecast to rise to 7.0 C later in the day. Parts of Nagano and Yamanashi prefectures, west of Tokyo, reported snowfall in the morning. The town of Kiso, in Nagano, got 13 centimeters in the six hours to 9 a.m., according to the agency. It warned snow could disrupt transport and cause avalanches in some regions, as it predicted snowfall of up to 25cm in the 24 hours to 6 a.m. Thursday in the two prefectures, and mountainous areas in regions north of Tokyo. A low-pressure system was expected to move from western Japan towards the Izu island chain off Tokyo by Wednesday evening, with an unseasonably cold air mass coming in some 1,500 meters above eastern Japan. Couples in first hearing on gay marriage say they are "not special"